On the morning of Saturday 18 December (the day after my work’s Christmas party!) Adrian, Nathan, Matt, Mick and I (Campbell) headed west to get ourselves lost in the desert. Nathan (my younger brother) and Adrian were there to start their training for the Finke Desert Race next year and I was there to get better acquainted with the bike that will take me 30,000 kms on our trip next year. We also had the good fortune of having Matt (Adrians’ brother-in-law) and his mate Mick join us in our support vehicle (Mazda Bravo). The weather wasn’t very promising as we hit the slab for the 4 hour stint up Horsham were we stocked up on fuel, food and supplies and as we constantly huddles from the cold, the only real excitement on this leg was a couple of light swarms of locusts that seemed to evade splatting on our helmets more that we thought might be the case. Thats not to say we didn’t get a good peppering – by the time we arrived in Horsham we were picking them off our bikes and gear. After stocking up we then headed up through Jeparit, along the west shore of Lake Hindmarsh and up to the start of Chinaman’s Well track. We we quite excited here by the fact that as soon as we turned off the big and wide dirt highway (Netting Fence Road) we were straight into the thick of it. As sand novices (and I fully laden with gear) the first stretch of the track was a massive learning curve. Before we could event get the hang of it though we were already in strife. Nathan, who was riding Adrian’s ’91 Kawasaki KLR Tengai had already developed a seemingly terminal oil leak! It looked a lot worse than the amount of oil he was actually loosing, but we decided not to risk it and set to work on finding the source of the problem in the next clearing (Lost Swap, i think it was called). I turned out that one of the rocker cover bolts had sheared and was just sitting loose in the the head, letting the oil come up around it. To fix it properly we would need to get the bike in a workshop and re-tap the thread… not really an option where we were and a trip finisher if we were to go back. Long story short, we were so desperate we resorted to a masonry bolt that Matt found in the bottom of his tool box. After a hefty debate at to the amount of torque that would be needed to really bite in without going too far and stripping the thread out further we applied a whole lot of silicon to finish the job. To give our botch job the best (and only) chance of success we set up camp for the night to let the silicon set. We’d hoped the rain had left us, but it didn’t really get started until we were packing up the next morning. The good news though was that the masonry bolt was holding up and the Tengai was running great. I’d also opted to ditch my swag into the Bravo and just run with my saddle bags, which instantly made finding my technique in the sand a whole lot easier. In the rain (and even hail!) we pushed through one of the hardest days riding I’ve had in a while, up through Chinaman’s well, then across to Milmed Rock track, back to Murrayville track, up to Murrayville, then onto Pink Lakes. While the sand was difficult at first, we quickly got used to it and could keep an alright pace for the most part. The thing that really took its toll (on Nathan, on the heavy Tengai more than anyone) was the weather and the mud that followed. Now normal mud we can deal with… There’s quite a lot of clay around Alexandra where we all ride normally, but we weren’t ready for the silty sand that we hit going through Milmed Rock Track. I remember I was following Nathan and Adrian and just as Adrian had found his rhythm on the sand and went to overtake Nathan, I just see him start to fish and head off into the trees! Nathan, hitting the mud right on Adrian’s back tyre had to take evasive action and while it appeared a lot more controlled than Adrian’s efforts it was he that took the line honours for the first decent off. I had time to kill my speed and come to a stop, but it really hit me, just how slippery this mud was when I went to trot back to help Nathan with his bike and I was struggling to stand! Needless to say the mud (and not knowing when you would come round a corner of deep sand to find yourself in it) really slowed down the pace for the afternoon and after a few more decent spills (including Nathan stopping himself sliding with his helmet and executing forward somersault on his Tengai) we were quite relieved to get onto the Murrayville track and cruise up to Murrayville. After sheltering from another shower out the front of the Murrayville pub, the executive decision was made to ditch the Border Track in favour of going through Sunset Country and we headed to Pink Lakes to try and find ourselves a campground with some amenities to help us thaw out. We weren’t completely successful, but at Lake Crosbie we found a picnic shelter that we set up camp under as the rain and wind kept whipping across the lake. The next morning it was a great relief to wake up to the beginning of a bright sunny day with not a cloud in the sky. After drying out out gear we headed into Underbool for fuel and then headed back up into Sunset Country. Now the original plan was to head up the Border Track for this stretch, but as we were slightly behind schedule and after the good things we’d heard about Sunset Country, we decided to spend the day heading up through there instead. I don’t think anyone was disappointed with the plan – Sunset Country offered such a great variety of terrain and as we zig-zagged up through the park we had soft sand, hard sand, rocky hills and twisty roads through the trees. Even though there were a couple of flooded sections in the park, there wasn’t a whole heap of mud and so we were able to turn up the speed a bit through this section. Credit must go to Matt and his co-driver Mick who kept an extraordinary pace behind us in the Bravo (I guess its only to be expected from a Defence Force Vehicle Tester!) and we were never waiting much longer than taking our helmets off for a breather. What really surprised us out here and on the previous day was the absence of other people. 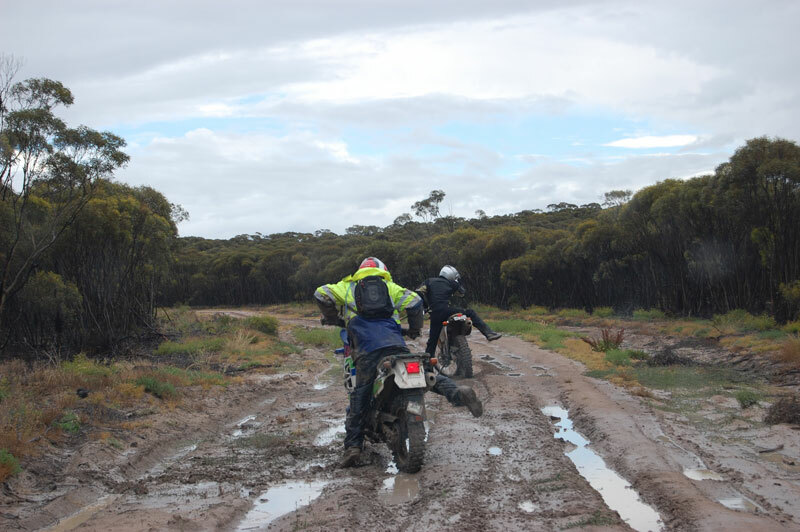 We put it down to the weather and the fact that it was the week before Christmas, but we had all the tracks to ourselves – the only time we saw people was in towns and at our camp at Pink Lakes. Big Desert Trip from Campbell Price on Vimeo. Emerging from the park just south of Werrimull, we cruised up the dirt highways through Werrimull to Cullulleraine and then up to the River Rd and the Renmark Mail Route. We had thoughts of going a bit further up along the tracks beside the Murray, however even the Mail Route was officially closed, so we didn’t want to risk the Bravo in mud that unlike its counterpart in Wyperfield/Big Desert had some real depth to it and not a whole lot of trees around to winch from. 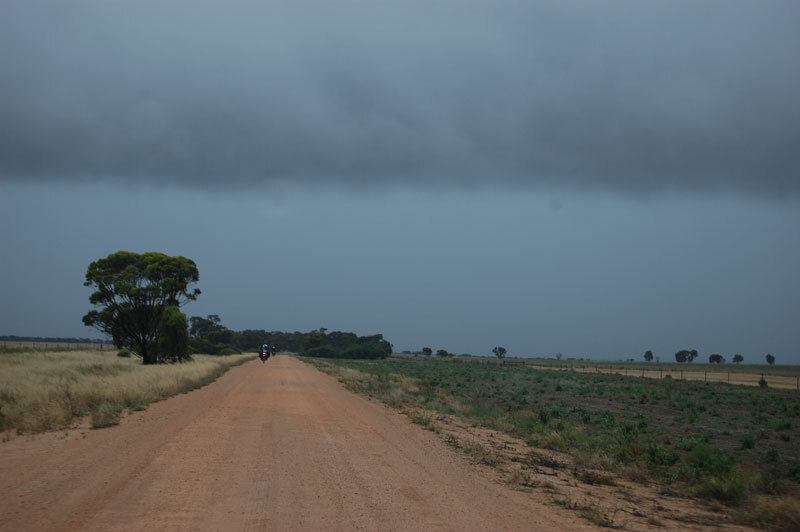 Travelling along the Mail Route, we could see the remnants of why it would have been closed and had a close call hitting a washed out section at speed, but apart from that it posed no challenge to the bikes or the Bravo and we were able to get all the way through to the outskirts of Mildura. I tell you what it was a bit of a shock coming out of two days on roads/tracks on our own, into Monday early afternoon peak hour traffic around Mildura and Irymple! Especially without the indicators and mirrors that had been jettisoned (and dutifully collected by our support crew) in the sand. It was one of the times when I really needed to use my comms to guide the Bravo behind us. We made it safe and sound to what was to be our camp for the night (family friends of the Caddaye’s – Thanks Jeff and Jude!) and couldn’t be happier as we hosed off the bikes and settled in on the deck overlooking the vineyards for a few beers to relax. Setting off the next day, we started the journey south, heading out through Red Cliffs and along the Kulkyne way to the top of the Hattah-Kulkyne National Park. The Kulkyne way was blocked about 10 kms into the park, but that suited us fine as we headed south on a track (forgotten the name sorry) that brought us out at the Mournpall Track, which we followed through the park to the Robinson-Redcliffs road. It was a pretty cruisey ride and I definitely recommend it as it was a whole different terrain again along the river. The tracks and roads were all in good condition (despite the flooding) and it was very easy to get around (just what we needed at this stage of the trip). The only sketchy bit of this section was when Adrian nearly hit a Goanna! Coming out of the park we headed north-east up the Robinson-Redcliffs road till just passed Lake Kramen were we headed south into Annuello Flora and Fauna Reserve. This was a pretty out of the way park and a lot of the tracks had grown over, but it served our purpose of avoiding tarmac as far as we could on our journey south. The overgrown, deep sandy tracks through here were good fun, but started to take their toll on energy levels so late in the trip. Coming out of the bottom of the park the tracks we were following us led us through farmland all the way down to the Calder. After our fun in the mud earlier in the trip, it wasn’t until this point that we found proper deep mud. There was one point where I was riding in the lead and thought I’d give a puddle a fairly wide berth (I’m talking 15 meters), only to find myself axle deep and eventually stuck! On seeing me Adrian went another 10 meters wide and still had trouble, leaving Nathan to coast on by 50 metres into the farmers paddock and back to the track where he still struggled to get a firm purchase for his stand so that he could come and help me out. I don’t like to admit it, but it was at this point that the call was made b-line it for home. We were tossing up staying around Bendigo for the night, however it was clear that we’d all had our fun and were now ready to get home to a nice warm bed. Slabbing it down from just north of Sea Lake was not awesome fun, though it was a cruisey ride until about 50 kms north of Gisborne when Adrian’s KLX400 packed it in. We were so lucky that we were so close to home and Adrian’s dad (Les) was able to come to the rescue with the ute and some cold beers! If this had of happened anywhere else it would’ve been a real mission getting home. After seeing the Adrian and Les off in the ute Nathan and I made the final push for Melbourne. Not long after (and just on dusk) the DR started surging and stalling. Pretty sure it was contaminated fuel we managed to make to the Calder Park services and the problem seemed to go away when I filled the bike with fresh fuel. Turned out to be water in the tank, but we managed to make it the rest of the way home without drama and it was an easy fix to clean out the tank and the carby over Christmas as I re-jetted the carby for the new Staintune system Father Christmas had brought me! Check out a rough map of our trip here.